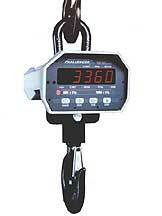 The Challenger II Crane Scales use a proven outer design with the latest internal electronic technology. With its low power consumption, digital calibration, filtering, and auto-sleep mode, the Challanger2 is a tough, dependable crane scale. The MSI-3360 crane scale is an ideal unit for the cost-conscious user for light capacity use. A rugged, low-profile enclosure minimizes headroom loss while maintaining weather resistance and portability. With several annunciators and oversized 1.2 in/30 mm LED digits, the display can be easily from more than 50 ft/15 m away. View the PDF version to see more information.